In November, a civilian court in Myanmar’s Shan State did what few courts in the country have ever done–it sentenced a soldier in the Myanmar military to prison for a crime committed against a civilian. It did so after the military court overseeing the case, under intense pressure from local human rights groups and media, agreed to transfer the defendant to a civilian court. 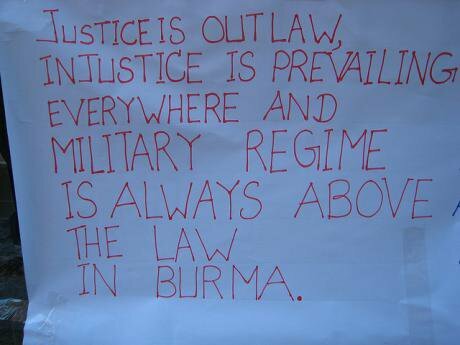 The Burmese law governing courts martial allows such a transfer to civilian courts when a soldier is accused of violating civilian criminal law, including sexual violence and murder. For many years, women’s groups and human rights organizations have documented the use of sexual violence as a weapon of war in areas of ethnic conflict in Myanmar. Sexual violence is used to terrorize ethnic civilian populations into submission and as punishment for their assumed support of ethnic armed groups. The Women’s League of Burma and its member organizations have gathered documentation showing that over 100 women have been raped by members of the Myanmar Army since the country started on its path to peace and democracy in 2010. Nearly half of the attacks were gang rapes. Most cases were linked to military offensives in Kachin and Northern Shan States. The push for civilian justice for military abuses is not limited to sexual violence. Torture and killings of ethnic civilians by the Myanmar military are also well-documented. While common in areas of ethnic conflict in Myanmar over the past decades, they have been more frequent in Kachin and northern Shan States in the past few years. Torture is used in and outside of detention. Villagers in areas of ethnic conflict report being tortured by members of the Myanmar military as punishment for their perceived support of armed groups, as revenge for a recent military defeat, or to instill fear. Villagers and displaced persons also face arbitrary arrest and detention because their ethnicity or place of residence puts them under suspicion of being members or supporters of an ethnic armed group. A primary challenge is Article 445 of the 2008 Constitution, which forbids legal action against members of past governments for actions undertaken by those governments. Although it is unspecific about who may be charged, and in what kinds of proceedings, it is widely interpreted as an amnesty provision guaranteeing impunity to members of the military and government for past and future violations. Yet, it has not completely barred judicial and non-judicial bodies from considering some violations. Another challenge is that military courts have jurisdiction over all Defense Services personnel, and the decision of the Commander in Chief on issues of military justice is final and conclusive. Myanmar’s military justice system is not open to the public, and civil society activists find it difficult, if not impossible, to obtain reliable information about pending or completed cases. Civilians, including victims and their advocates, have no right to be present at the trial or to obtain any information about the charges, findings, or sentence. A recent report by the Women’s League of Burma details the challenges in pursuing military justice, including the transfer of the accused to new jurisdictions, lack of transparency, and intimidation. Even when civilian courts gain jurisdiction over military personnel, victims’ rights are impeded by institutions that should support them. Police often cooperate with the military to pressure victims to stay silent, sometimes offering compensation in exchange for agreements not to press charges or inform the media. Human rights defenders face threats of retaliation and experience difficulty gaining access to victims. These cases represent some of the first efforts to deal with the past and obtain justice for victims of human rights violations in Myanmar. The work of civil society, politicians and media on these cases is admirable. However, the current ad hoc approach is not sustainable. Groups such as the Women’s League of Burma and its member organizations struggle to provide the necessary support for the growing number of victims who approach them for help in seeking justice. The military and government can take steps in the short term that would make a significant contribution. The military courts should authorize more transfers of cases of sexual violence, torture, and killings to civilian criminal courts when requested—starting with accepting the recommendations of the Myanmar National Human Rights Commission in the Par Gyi case and taking steps to ensure the trial is fair and effective. A policy that directs all military courts to transfer these cases automatically, or at the least on the request of the victim, should be adopted. In a recent interview with Voice of America, Commander in Chief Senior General Min Aung Hlaing confirmed that, although the military would decide in most cases, civilian justice is an option in some cases when soldiers are accused of human rights violations. The responsibility to provide a remedy for violations goes beyond criminal justice. The Myanmar government should take responsibility for the medical, psychosocial and other needs of survivors of sexual violence and torture, as well as the family members of victims of killings. The government should also reform its laws governing these crimes to meet international standards and undertake an investigation of institutional factors that enable or encourage systematic use of sexual violence, torture, and killings as weapons of war, with a view to recommending reforms to prevent their recurrence. At a time when building trust and reconciliation at all levels—from communities to leaders of armed groups—is a high priority for the Myanmar government, it is important to take steps to address the abuses that civilians have suffered in conflict. Without accountability for perpetrators, and without recognition or support from the government to remedy these violations, the survivors of sexual violence and torture and the families of victims killings cannot be expected to have any trust in reforms.